The earclip electrodes consist of two cup electrodes mounted as an earclip. 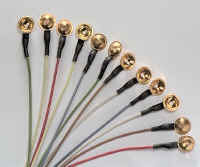 These twin cup electrodes are available in four different surface options: silver, silver/chloride, gold-plated or tin. The cups themselves come in two diameters, either 10 mm (0.39") or 6 mm (0.24"). All electrodes are attached to a 1.00 metre (40") or 1.5 metre silicon coated wire, terminating in a DIN 42802 (1.5 mm Touch Proof) connector..
Each package contains two ear clip electrodes with colour coded leads..
Silverchloride on plastic, disposable cup electrodes with cable, terminating in a DIN 42802 (safety DIN) connector.